Ross weather station is located just off Walford Road near to the junction between Walford Road, Kent Avenue, Archenfield Road and Ashfield Park Road. 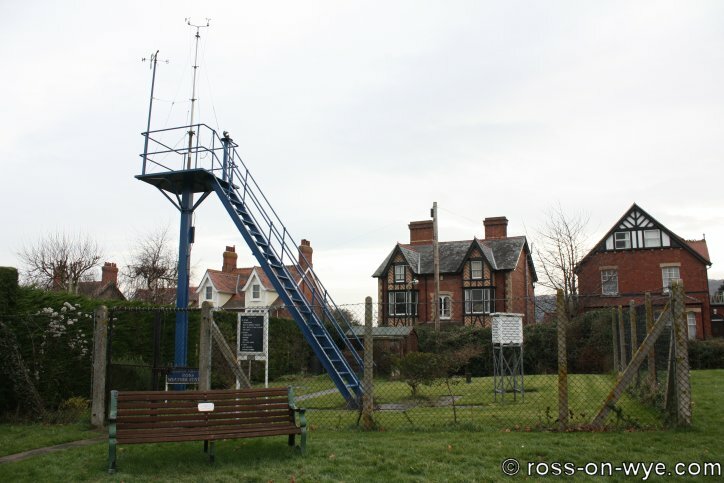 The Ross-on-Wye Weather Station was the Mayoral Project of Councillor G.A.Clarke who was the Mayor of Ross from 1984 to 1985 and it was opened by Ian McCaskill on 16th May 1985. The weather station has its instruments mounted on (or in) the ground, in a screen or on the tower. The readings were manually recorded and were taken twice per day at at 9:00am and at 5:00pm. The readings were originally taken by Howard Ellis, a retired chemist, and he was assisted by husband and wife team, June and Rex Swallow. June then took over the monitoring station in 1995 until she retired in the Summer 2008 after taking the readings for 23 years. At the 2008 Town Council AGM June was given a Community Award and rose bowl in recognition of her service to the Town. 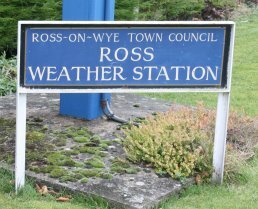 The readings are now being taken by Gill Roes-Franken who now to provides the data necessary for Ross-on-Wye to continue to appear on the BBC weather map. The readings can be seen [ here ]. The tower seen above is not the original one. Previously there was a lattice work tower, similar to that used for water pump towers like a small electricity pylon, that had anemometers (wind speed indicators) at the top. This also supported the siren for the Town Fire Brigade and was used to call the firemen to the station when needed. The siren was always tested at midday on a Wednesday and could be clearly heard for many miles around. This siren was originally the the Town's air-raid siren during the Second World War. Mr Parsons was responsible for setting up the current observatory site in Ross and the following is the story behind it1. In 1964 stating at 6am Frederick James Parsons (at 72 years old) was still climbing the 35-ft tower to collect the sun shine record and solar thermometer readings. He did this whatever the weather, 50 mph gales and driving rain or snow, in the hope that he might observe a new record (of which he held quite a few). He was celebrating his golden jubilee of personally taking readings with only a small break for war service. He took 15 readings (including ground, 1 ft and 4 ft thermometers, rainfall, pressure and dew point) which, in a little hut below the tower, he converted the readings into a code and telegraphed them to the Air Ministry. The readings were taken 6 times a day (7 in summer) at 3 hourly intervals 365 days a year. The only reading he did not have a reading for was thunder and lightening for which he has to rely on his own senses. As a 15-year old in Eastbourne, he was inspired by the newspaper reports of the weather which had just started to be sent by Marconigram. He then made his own measurement equipment such as a rain gauge and U-gauge barometer and bought a thermometer so that he could set up his own "station" in his back garden. He had to persuade his mother to move the washing line so that the drips did not cause any offset to the readings. His weather studies were carried out by observation and by borrowing books from the library. His primary interest was music and Mr. Parsons spent 2 years in Paris as a chorister at the American Church and he came top in the whole of England in the Cambridge Local Music Examination after which he trained at Winchester Cathedral. Following this, in 1912, he got the £50 a year position of parish church organist and choirmaster and so he came to Ross. He became friendly with Mr. Henry Southall who had established a station at "The Craig" in 1859 and so he set up his own station in 1914 at the "Chase Dale" which was the home of Mrs. H. Edith Purchase. In 1914 he was made a Fellow of Royal Meteorological Society but due to the outbreak of war he joined the Herefordshire Territorials and was transferred to the Royal Engineers as one of the first five meteorologists to be in the service. He returned in 1919 and unfortunately by which time Mr. Southall had died so Mr. Parsons continued with the Chase Dale station which Mrs. Purchase had maintained in his absence. In 1920 the Met. Office was formed as an offshoot of the Air Ministry and Mr Parsons received his first token payment for the readings he was supplying four times a day. Prior to this enthusiastic amateurs had supplied the readings free of charge. When Mrs. Purchase died in 1921 she left him the site of the current observatory and an assurance was given by the Air Ministry that this would be a permanent station for all time. He noted in the paper that they all occurred in November or February, except in 1809, which was at the end of January. It also appeared that very high floods were not so frequent as in former years and this was particularly true on the Wye. The possible reason he gave for this was that that with better drainage the flooding in the lower reaches of the river was carried off before the upper flood arrives and more quickly than previously.He also hypothosised that Railway embankments and additional bridges were supposed by some to "keep back" the water. He did note that it was not attributable to diminished rainfall. 1 Details on Mr. Parsons taken from Hereford Times, Friday 12th January 1962. 2 Title: 1894 December 19 meeting of the Royal Meteorological Society Journal: The Observatory, Vol. 18, p. 46-47 (1895) Bibliographic Code: 1895Obs....18...46.